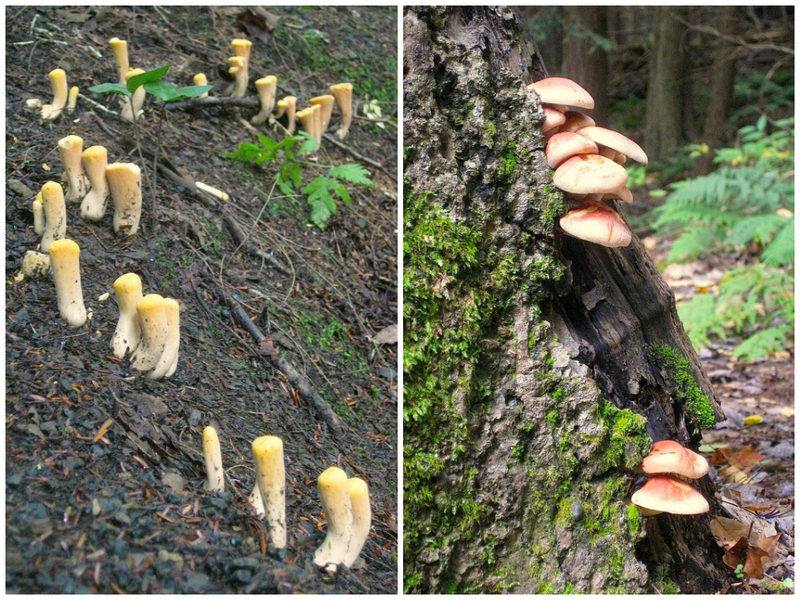 Club coral (Clavariadelphus truncatus, left) and brick caps (Hypholoma sublateritium, right) are two mushrooms that inhabit western Pennsylvania. And both mushrooms share a unique and remarkable trait: possession of the anti-cancer, anti-tumor compound – clavaric acid (not an illegal act in the forests apparently). Within our bodies, there are genes (“ras” genes) which code for numerous proteins that function in cell growth and differentiation. This is normal. Mutations in these genes, however, can code for proteins that essentially become “stuck” in the growth signal transmission state – leading to uncontrollable growth … which could eventually result in cancerous conditions. Ras proteins require enzymes known as FPTases for both normal and cancerous activities. An inhibitor of these enzymes, research suggests, may be an effective way to impede cancerous proliferation. And what do ya know … the compound isolated from these mushrooms – clavaric acid – has been shown to be an effective FPTase inhibitor. Research also suggests that these inhibitors may be effective cancer-prevention tools, particularly against colorectal, pancreatic, and lung cancers (Kelloff et al., 1997). I don’t know too many people who own laboratories, so it may be difficult for us to isolate clavaric acid ourselves. These mushrooms are edible though, and perhaps we are consuming minuscule levels of this compound with every bite. And perhaps these minuscule levels aren’t for naught … maybe they really do add up. And maybe they’re absolutely necessary – all these myco and phytochemicals – for us to thrive today in a world teeming with at least 84,000 synthetically-derived chemicals (released into the environment since 1975, according to the TSCA Chemical Substance Inventory). Club coral (left) can be found among coniferous woods in late summer and fall (a bit too late for them now … this picture was taken in late August). Brick caps (right) can be harvested throughout autumn, sometimes into the early winter months. Everything we need (yes, everything) is all around us … not necessarily at the mall, not necessarily in the supermarket … but surely in nature. Categories: Fungi, Medicine | Permalink.